Section under construction more coming soon! Artisans of the Valley resides in a shop that most clients find amazingly compact for the type of work we do and the volume that we can produce. We're small, hands-on and low overhead. We're constantly working to improve our use of space, upgrade equipment, and find more efficient methods of handling our limited space. We'll be profiling our shop and supporting surroundings as time allows. 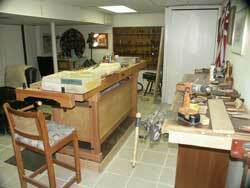 The most recent improvement is a new basement floor and the addition of the ultimate carving bench. We have over 300 antique carving tools, and three dedicated carving benches with multiple vices of various sorts. 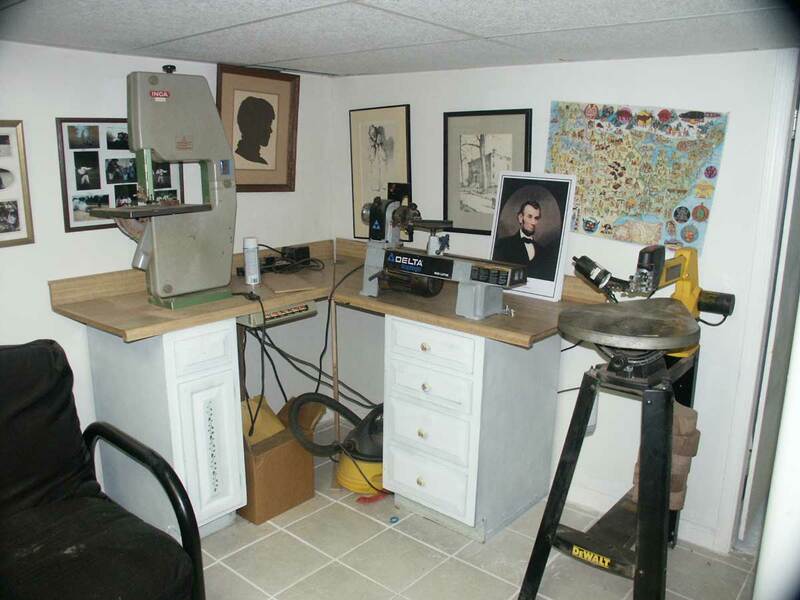 Small detailed work requiring a midi-lathe, precision band saw, and a scroll saw are setup in this corner nook. Our game plan is to keep our main equipment and assembly/finishing area in our upper garage space, and all the supporting processes are moving to our basement. Now this area is going to be one of the best features of our restoration shop. We're in the process of obtaining and organizing more and more and more hardware all the time. 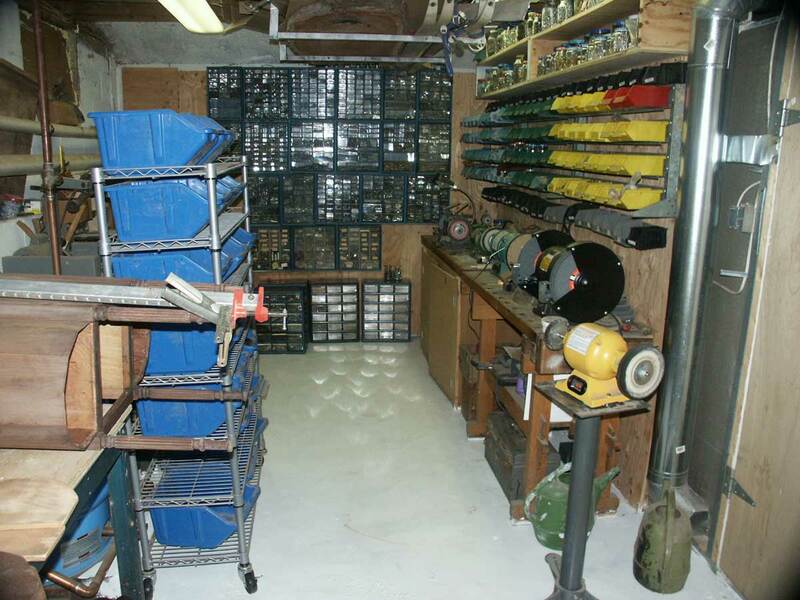 We're adding new bins and store houses to organizes tens of thousands of antique screws, nuts, bolts, washers, nails, knobs, pulls, and other hardware items. Check back on our progress, soon this whole section will be wall-to-wall floor-to-ceiling hardware. In addition, our knife and carving tool making and maintenance equipment is setup in this area. 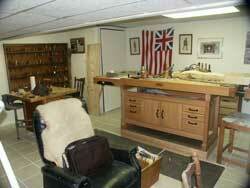 We are equip to sharpen knives and tools, and plan to expand into scissors and sheers shortly. Storage is a premium, everywhere there is space we stash something. 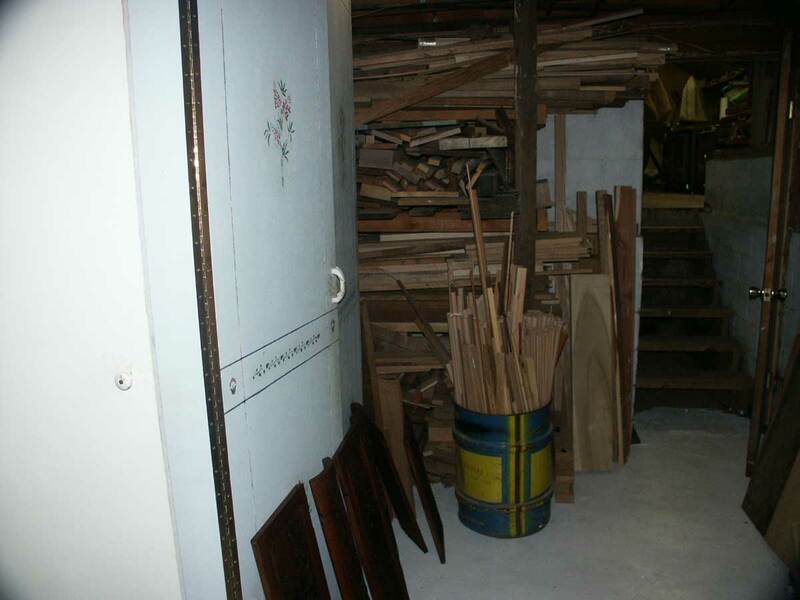 Scraps of wood can overwhelm any shop, no matter how big. 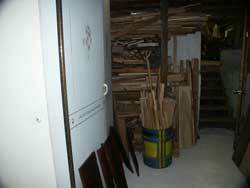 Throwing out a scrap is a painstaking process to any woodworker, so this is one of many materials storage areas. 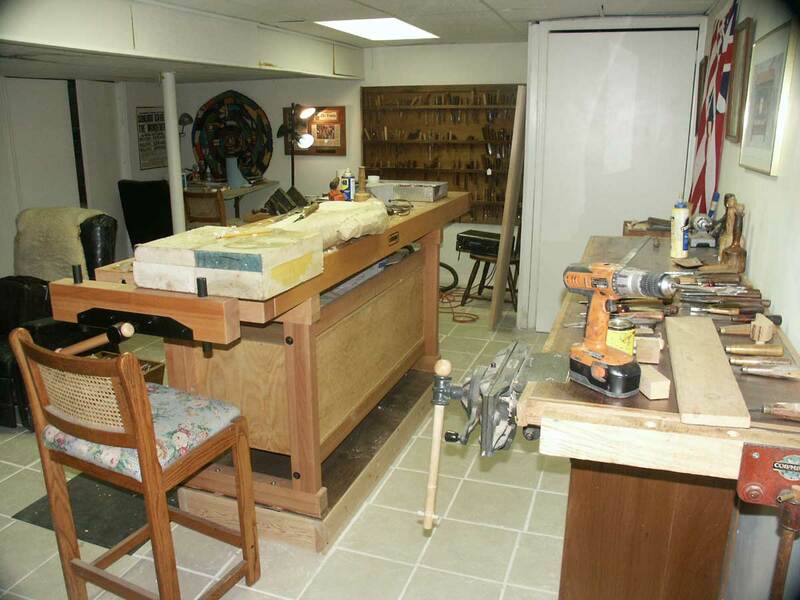 Getting a new and larger building, well we think about it every time we run out of floor or storage space, each time we bump into something, or find we're working on a saw bench to finish a piece of furniture. Then we realize that the purchase price, taxes, heat, insurance, extra utilities, etc ... well we'd simply rather stay in a small space and avoid working to cover nothing but overhead.